Designed to be overprinted with your course details. About "Posters A3 (Pack 4) (The Alpha Marriage Course)"
Nicky and Sila Lee have been married for over 30 years and have four children. The are on the staff at Holy Trinity Brompton, London, UK. They have spoken to thousands on the subjuect of marriage and family life, co-authored The Marriage Book and The Parenting Book, and created The Marriage Course and the Marriage Preparation Course. Marriage Course, developed by Nicky and Sila Lee, is a seven-session study for couples to obtain the tools to build a strong and healthy relationship that lasts a lifetime. The manual highlights the key points from the talks and contains all of the exercises with plenty of room for making notes. From the "home" of Alpha, THE MARRIAGE COURSE is a brilliant series of seven sessions was filmed in a studio and includes interviews with couples talking about their experiences of marriage and street interviews from around the world. There are also two additional sessions: The Marriage Course Party and an Extra Session entitled Coping with Times of Separation for couples in the armed forces and others who spend long periods of time apart. The DVD set now comes with the Leader's Guide. How can we be happily marriage to one person for the whole of our lives? How do we resolve conflict? How can we discover and rediscover sexual intimacy? 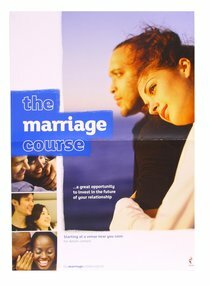 Full of practical advice, The Marriage Book is easy to read and is designed to prepare, build and even mend marriages.